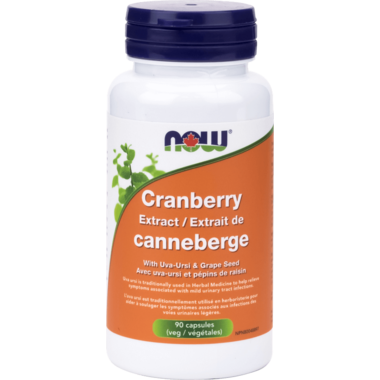 NOW Foods Cranberry Extract Veg Capsules has naturally occurring compounds called proanthocyanidins (PACs) that exhibit anti-adhesion properties in the urinary tract and help to maintain a clean waste stream. Cranberry has become an essential component in the promotion of sound urinary tract health. This product makes it simple to support healthy urinary tract function, with each 3 capsule serving delivering 1,000 mg of Cranberry Extract standardized to a minimum 1.5% PACs. For added support, NOW has also also included 300 mg of Uva Ursi Extract and 45 mg of Grape Seed Extract per 3 capsule serving. Non-Medicinal Ingredients: Veg Capsule (hypromellose, water), Silica, Magnesium Stearate (vegetable grade), Cellulose. Caution: Consult a health care practitioner prior to use if you have a history of kidney stones, are taking blood thinners and if symptoms persist or worsen. Do not use if you are pregnant or breastfeeding. May cause nausea or vomiting.